Series 1 race was won by Duncan Adams from Paul Kelly and Paul Jago; Paul Kelly sailing a brand new boat on her first time on the water. 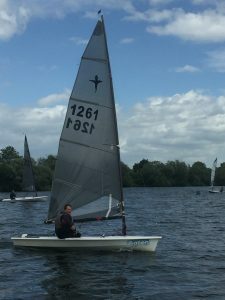 Series 2 race was won by Kevin Last from from Ruth and Nick Marlow and Paul Jago; Paul has actually been third in all eight races he has sailed in the Frostbite Series. With one race to go both series are wide open with three or four boats able to win overall and will depend who turms up next weekend so should be some great racing. Remember following Sunday is the Christmas Race.